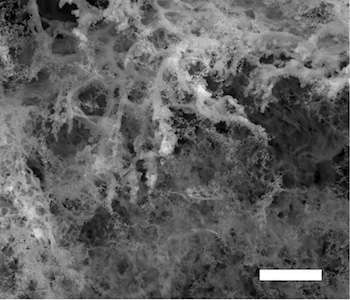 Rice University scientists who invented laser-induced graphene (LIG) for applications like supercapacitors have now figured out a way to make the spongy graphene either superhydrophobic or superhydrophilic. 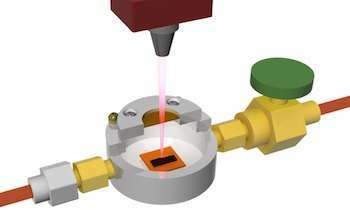 Until recently, the Rice lab of James Tour made LIG only in open air, using a laser to burn part of the way through a flexible polyimide sheet to get interconnected flakes of graphene. But putting the polymer in a closed environment with various gases changed the product's properties. Forming LIG in argon or hydrogen makes it superhydrophobic, or water-avoiding, a property highly valued for separating water from oil or de-icing surfaces. Forming it in oxygen or air makes it superhydrophilic, or water-attracting, and that makes it highly soluble. The research at Rice and at Ben-Gurion University in Israel is the subject of a paper in Advanced Materials. "Labs could make graphene either hydrophobic or hydrophilic before, but it involved multiple steps of either wet-chemical or chemical vapor deposition processes," Tour said. "We're doing this in one step with relatively cheap materials in a homemade atmosphere chamber." The labs got a bonus when they discovered that fabricating LIG in oxygen increased the number of defects – 5- and 7-atom rings – in the graphene flakes, improving its capacitance and its performance when used as an electrode material for microsupercapacitors. Changes in the chemical content of the gas and even changes in the direction of the laser raster pattern altered the material, leading the researchers to believe LIG's hydrophobic or –philic properties could be tuned. They also discovered when they scraped graphene off of a hydrophilic sheet of polymer and turned it into a film, the result was hydrophobic instead. "That leads us to believe the surface orientation of LIG's flakes have a lot to do with how it reacts with water," Tour said. "If the edges are more exposed, it appears to be hydrophilic; if the basal planes are more exposed, their hydrophobic properties take over." The discovery that surface type and chemistry affect LIG should also allow some leeway in adjusting the material's properties, Tour said. In fact, when they used a sulfur/fluorine gas to make it, they raised LIG's superhydrophobicity to 160 degrees.